Gums don’t always have a place in people’s perception of your appearance. You may not even give your own gum tissues a second thought, unless you have too much or too little. Gingival tissues (i.e. your gums) are one of the major components which make up the anatomy of your mouth. Periodontal disease is one of the two most common and destructive progressive oral diseases. (The other is tooth decay). How much do you already know about your gums? Find out by attempting this periodontal quiz from Lafayette dentist, Dr. Michael Young. Q1. True or false: Gum tissues are purely cosmetic. Q2. True or false: It is normal for gums to bleed. Q3. True or false: Gums can be a part of the cause of feelings of tooth sensitivity. Q4. 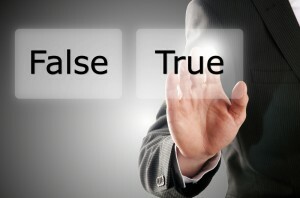 True or false: Gum recession occurs solely as a result of genetic determinations. A1. FALSE – The pink tissue known as your gums covers the bone of your lower jaw and supports your tooth. Periodontal tissue also includes the connective ligaments between the outer coating of your tooth root (called cementum) and the jawbone which supports it. A2. FALSE – Because it is so common, many people believe that bleeding gums are harmless, and perhaps natural. The truth, however, is that bleeding is not a healthy or normal function of any part of your mouth. Bleeding gums are often an early sign of gingivitis, the beginning stage of gum disease. If you experience redness, bleeding, or swelling of your gums, contact Dr. Young as soon as possible to schedule a dental examination. A3. TRUE – Although a separate entity from your teeth, your gums play a vital role in their protection and health. Gum disease, a progressive oral disease that destroys your gum tissue and supporting ligaments, can also cause your gums to recede from your teeth. Gum recession uncovers your teeth’s roots, which are not protected by enamel and can cause significant discomfort when exposed. A4. FALSE – Healthy gums are securely attached to teeth with connective tissue. In the beginning stage of gum disease, bacterial infection and inflammation work to destroy this tissue, causing your gums to pull away from your teeth, or recede. While gum disease is a common cause of gum recession, it is not the only one. Periodontal tissue can also recede from a lifetime of use as you grow older. To help prevent gum recession and reduce your risk of gum disease, be sure to practice good oral hygiene by brushing your teeth twice a day and flossing at least once. Brush gently, paying special attention along the gumline where plaque can accumulate and lead to gum disease. If you live in the 70508 area and would like to learn more, or if you would like to schedule an appointment with Dr. Young, call our Lafayette dentist office at (337) 237-6453.